Do you have times where you fight what comes naturally to you? 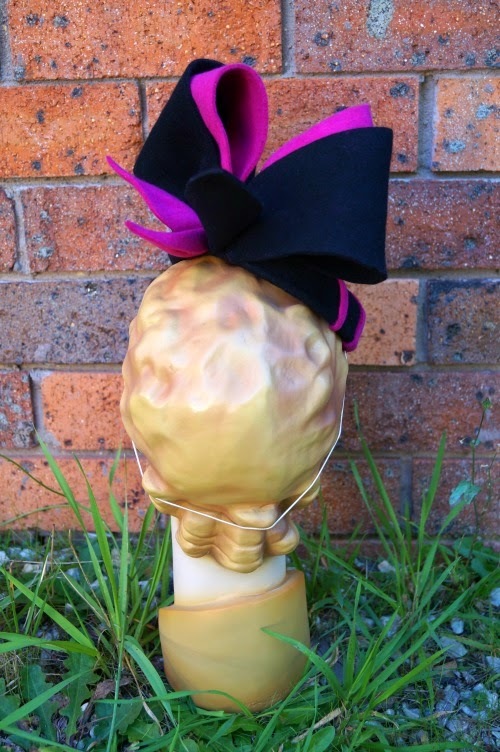 One of my ex-colleagues commisioned me to make her a fascinator for a birthday party at the races. 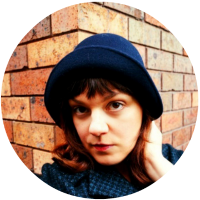 First up, I want to share the hat with you, before I get a bit deeper into its story. The outfit was a black dress with white polka-dots, worn with pink shoes with bows. 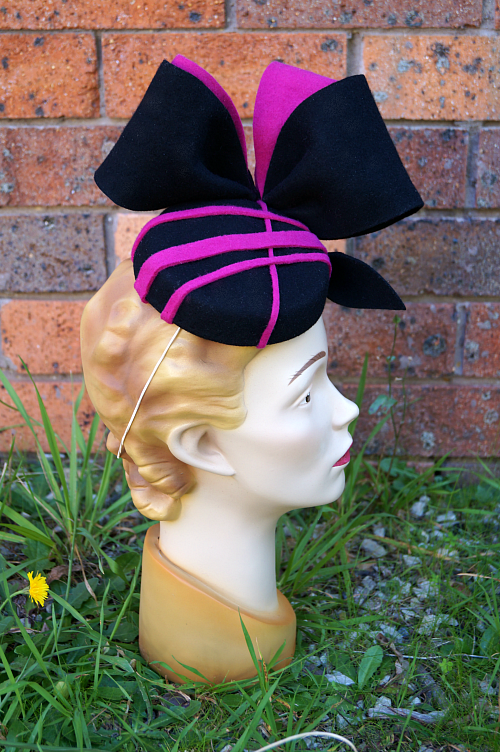 We discussed a few options and settled on a pillbox base with a bow. I went with my doubts. I drew up the pattern for the pillbox shape I wanted, constructed a foundation from buckram and wire, and set about covering it with the fabric I had purchased. Begin disaster. The fabric wouldn't do what I wanted, it didn't sit right, it didn't look nice enough, and then my brain started to sabotage my work when I sewed some fabric together for the bow and didn't leave any gap to turn it through. (Not that this has to be a sign to give up, but on top of my other frustrations, I couldn't handle it.) There may have been tears. So I looked at my felts. I had black. I had pink. I was set to go. 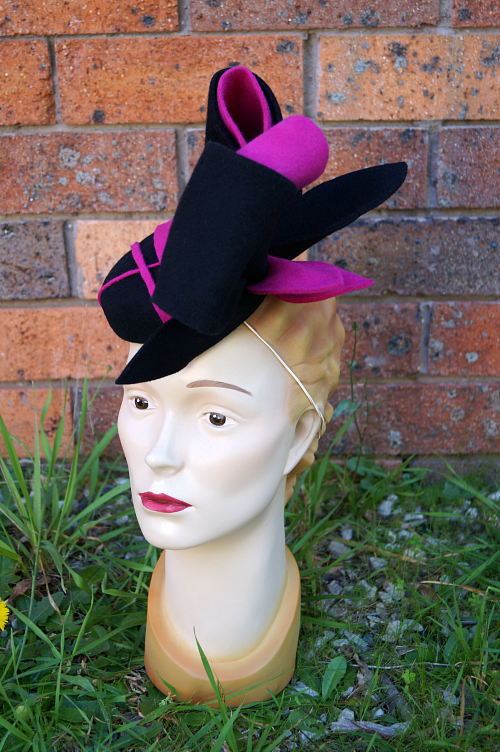 In one day I created this hat from start to finish. I blocked. I shaped. I enjoyed the process, including the little quibbles I always have with the materials and design along the way. I sat back and looked at my work and was happy. I seem to face this issue again and again without really ever learning it. Sometimes you just need to go with the flow, and do what you are good at. Of course, you still have to challenge yourself, but picking the right time to do so is critical. On a commision with a deadline, maybe not so much the right time. Also apparently I love covering pillboxes with lines. 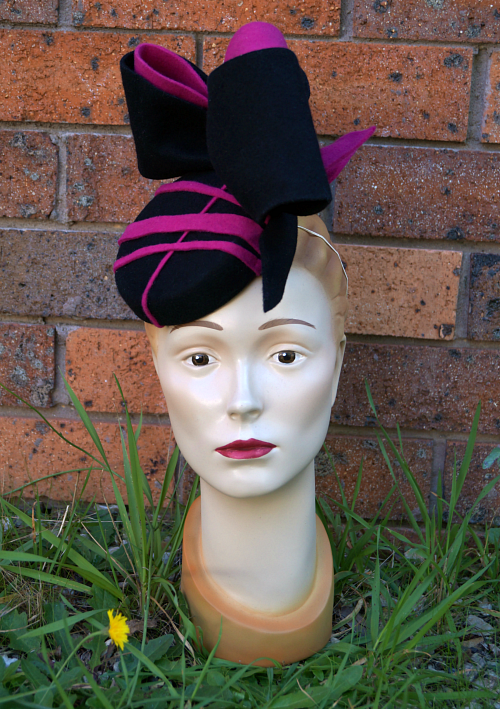 This one makes three, joining the 1940s custom pillbox and the "Pink Dragonfly" sinamay makeover hat. Do you have this kind of creative self-sabotage and doubt too? More importantly, do you have a 'go-to' material or method that can usually rescue you from these downs? Get ready for some seriously bright and bold colours. It's a grey misty day here in the blue mountains and looking at these pictures makes me feel a lot sunnier (despite the umbrella). I hope they can do the same for you. One of the goals I wanted to achieve this year was to get more social, get to know other bloggers, and do some collaborations. 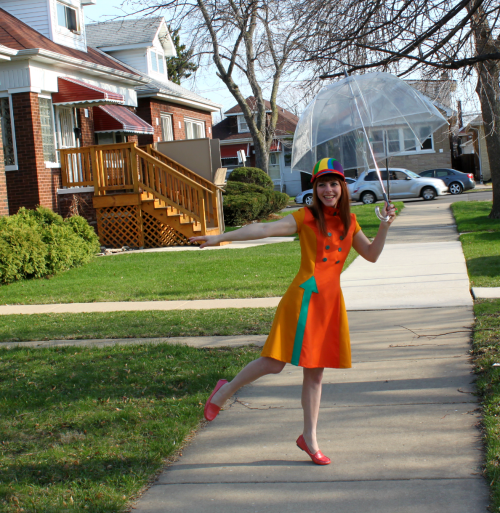 As I started preparing for my Hats of the Past blog series, I searched for blogs about sixties style to help me find my feet in the first focus era. 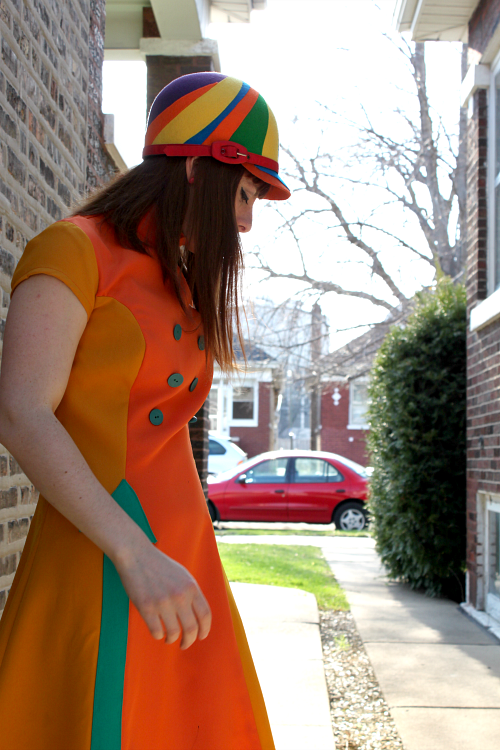 Hence I met Nicole Capoccitti of Manic Pop, and before long we were working on a 1960s style collaboration. 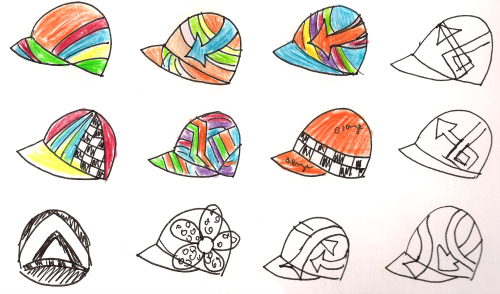 Nicole and I both loved helmet hats, so that is what I made for her. 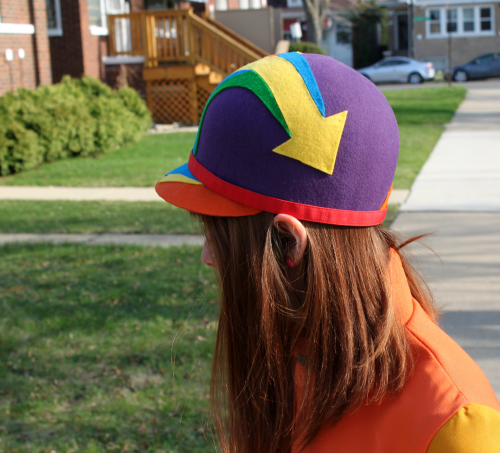 After some initial brainstorming, I worked on the design and hat in secret, to be a surprise when it arrived. Nicole mentioned early on that she was into arrows at the moment, and from her own dress designs and personal style it was clear she likes bright colours. I was excited to have free reign to do something really bold and over-the-top. I spent a lot of time sketching, and kept being drawn to the arrow with rainbow colours radiating from it. 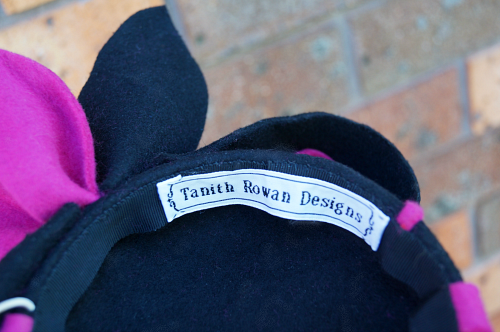 The hat shape is blocked from the purple felt, with the colour panels individually cut and shaped to create the patterns. 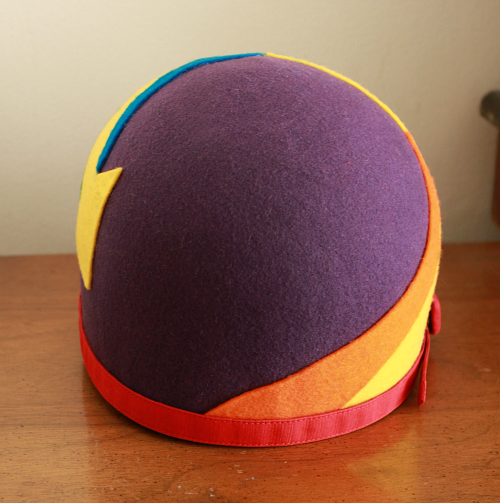 I used a thinner wool felt for the surface decoration, because I couldn't source the colours I wanted in millinery felt, but it was also easier to manipulate in this way. 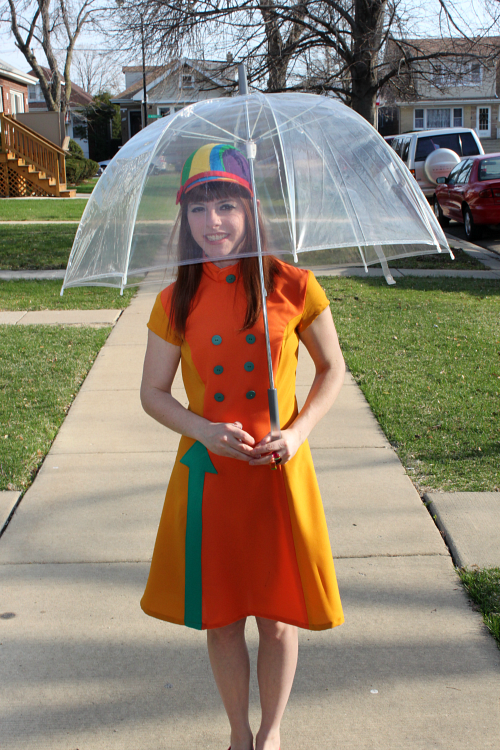 When the hat arrived in America, Nicole set about the task of designing an outfit to go with it. She created this gorgeous dress, which she has named after me! Awww! I'm a dress! And I couldn't have a cuter dress named in my honour. Don't you just love the buttons and the arrow and everything about it? I do. I had such an amazing time doing this, and I'm so pleased with the results. I hope there are many more creative collaborations in my future, including more Tanith Rowan - Manic Pop crossovers. Nicole's has written a blog post about our collaboration too, with more pictures. I also recommend looking at her other dress designs. My favourites are the Petra dress and Trafalgar dress. 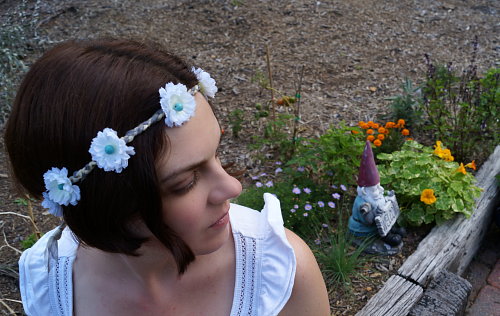 You should also check out the Manic Pop etsy shop and Manic Pop on facebook. When you start your own small handmade business, the general assumption seems to be that you will sell at markets. I wasn't personally keen on the idea. I'm a shy person, and a fairly classic introvert, and a perfectionist, and generally afraid of putting my work 'out there' to be judged (in fact, I basically dropped Visual Arts in high school for this reason). 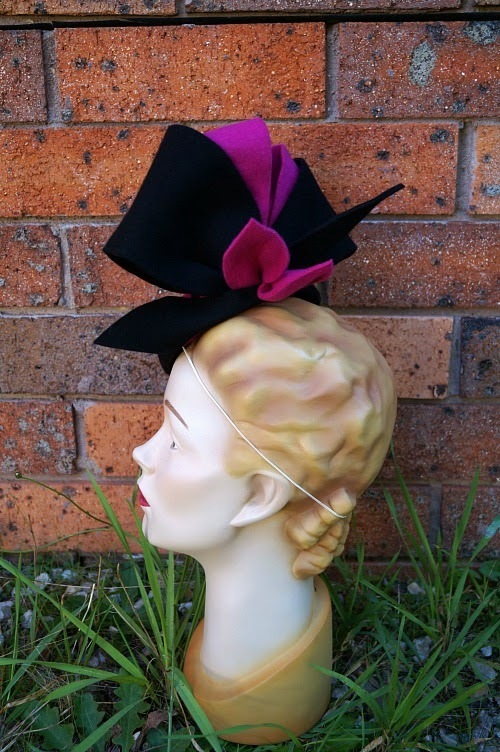 On top of that, vintage-style millinery is rather a niche offering and different to most crafts found at your average local market. Having said all that, my grandmother Wendy still managed to convince me to have a stall at the Mudgee Makers Market on Easter Saturday. Mudgee is a pretty country NSW town about 2 hours from me, with gorgeous surrounding countryside. It was a beautiful sunny day, although quite cool, and the market was bustling. 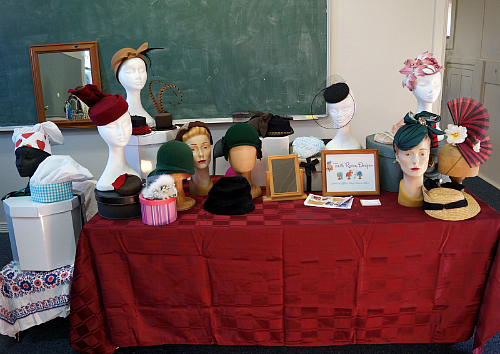 This is my initial setup, although Wendy later arrived with some more of my hats that had been at Wattle Flat Crafts. Setting out my work like this was a fun experience, and a good reminder of what I've created. As usual my fears were unecessary. People were very nice and full of compliments for my work. Lots of hats were tried on, and I sold a few things, which was enough to make back my stall fees and more. I still wouldn't say that it's my favourite thing to do, but I'm willing to give it another try sometime. Especially if there are more pancakes with berries and locally made ice cream. 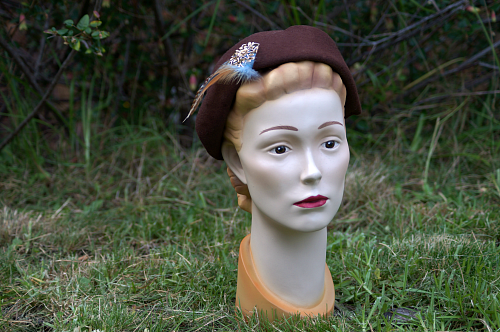 One of the new hats I made for the market was this chocolate brown felt. It looks much better on a real person than the mannequin head, but I'm afraid I wasn't in the mood to make myself presentable for some photos, but I'll try to get some later. It didn't attract much attention at the market on display, but I love it on me, so I started wearing it later in the day. I'm tempted to keep this for myself, as it's a style that suits my current hair. It strikes me as a 1940s kind of style. What do you tihnk? I also want to share my new friend. 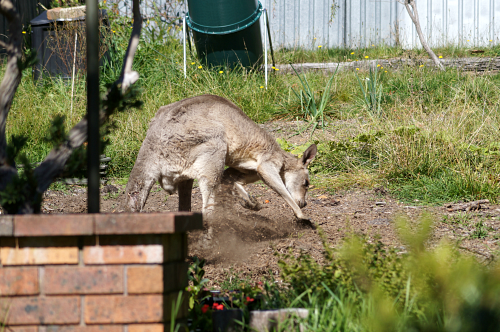 While we know that kangaroos are regular visitors to our garden during the night, we only see them occasionally, if we get home really late or if the morning is misty and they stay around the local streets longer than usual. The last week or so has seen this guy hanging around until the early afternoon. 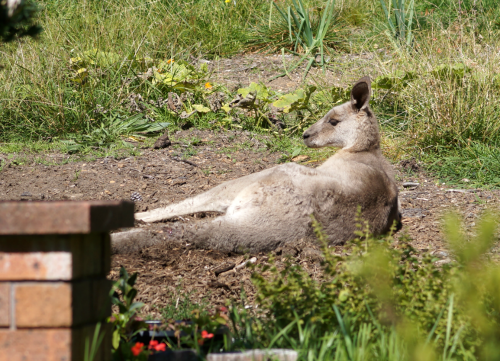 He digs in the dirt patches then lies down. He has a wound on his tail, which he covers with dirt, we assume to keep the flies off. We've called WIRES and they are aware of him and a local rescuer is keeping an eye on him too. It's a nice reminder of the benefits of living where we do. And he's only damaged a few plants! 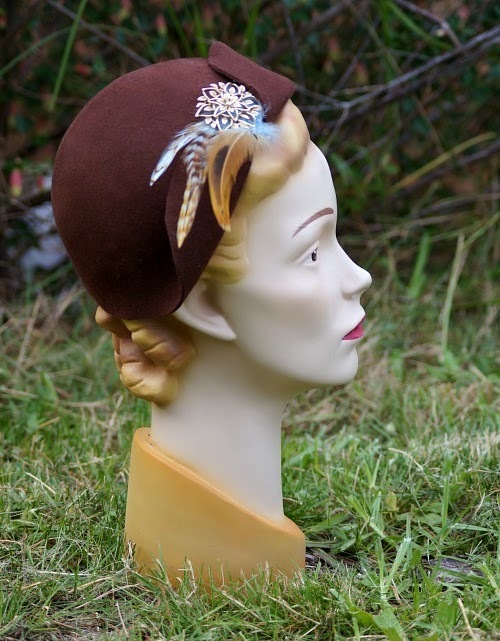 I have a couple more new hats from the market to show you soon, and I'll be moving on to finally start on the 1950s in my Hats of the Past series. 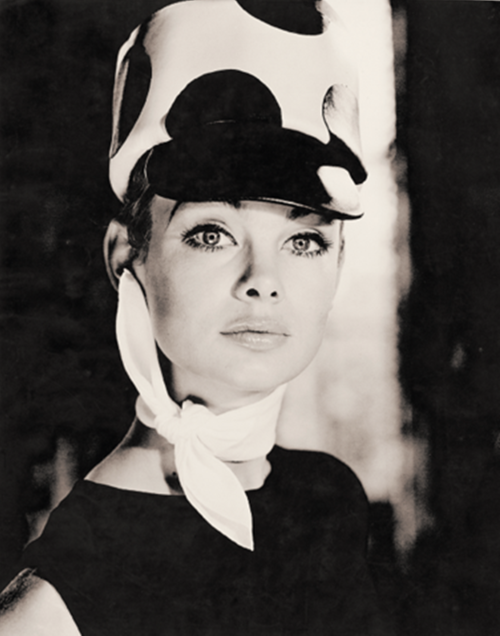 One of the hat styles I fell for early on in my 1960s research was helmet-style hats. They vary in shape and style significantly, but I love every one I see. 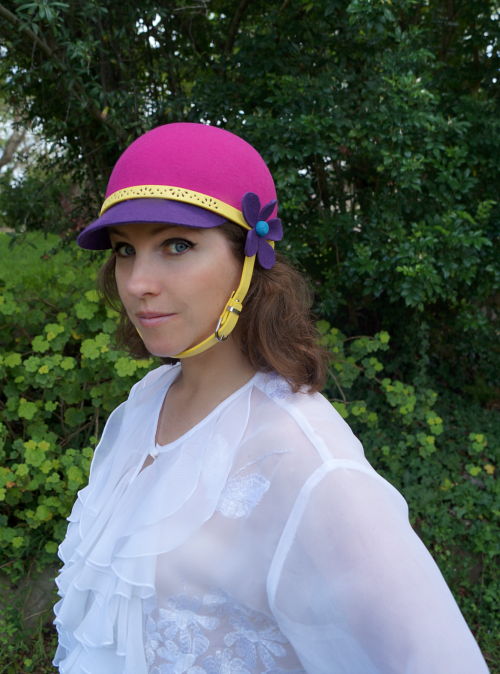 I already mentioned helmet hats in my Made in Paris review, although I didn't watch that movie until after I made my versions. That one was at the tall end of the spectrum. “Lunar Whites”, Harper’s Bazaar, August 1966, from Gosta Peterson Images. 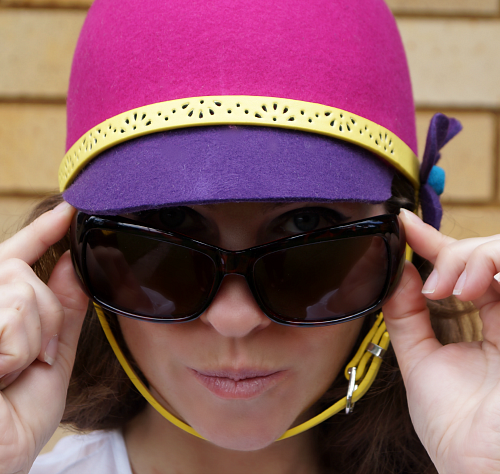 The helmet hat appears in two main contexts - as space age, or connected to motoring style. This ridiculously gorgeous photo gives us a clean white helmet hat in a very futuristic context. Audrey Hepburn in How to Steal a Million (1966). 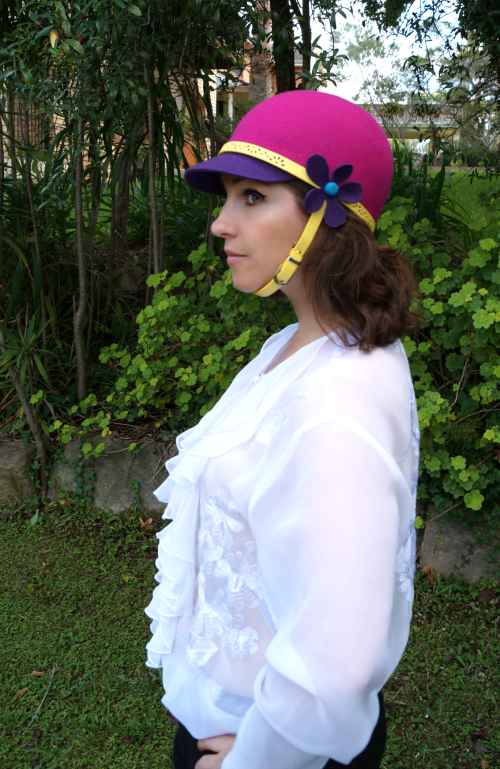 Again the focus in left on the shape of the hat with pure white colour for the hat and the accompanying outfit. 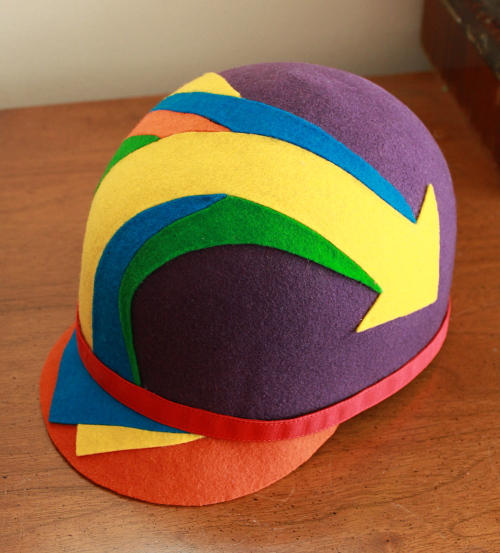 I haven't actually seen this one, I'll have to add it to my "to watch" list, so I can see this hat in action. 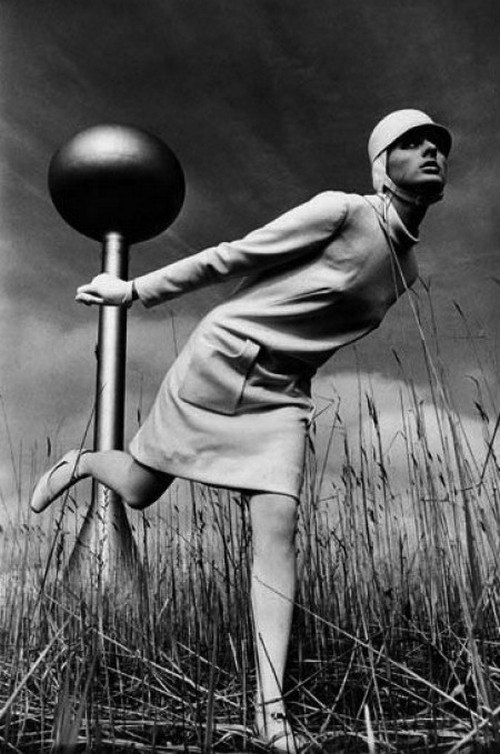 Fashion photo by Norman Parkinson, which I found at Annie's Fashion Break. 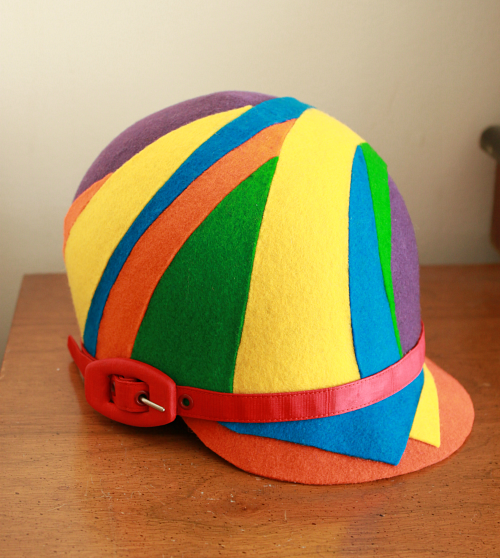 Another very tall version of the helmet hat, still quite simply decorated, this time with large spots. From the shine, I imagine it is leather. I don't have a context for this photo, but the scarf makes me feel it is more driving-around-in-your-convertible than exploring-the-moon. On to the first of my versions. It's funny how you look at your inpiration images, then go off and make your own with them in the back of your mind, but you take it somewhere else. When you come back to look at your original inspiration, you've gone wandering further off that you thought. Sometimes it's disappointing, sometimes exciting, sometimes just weird. I'm not sure what this one is. A bit of all three perhaps? 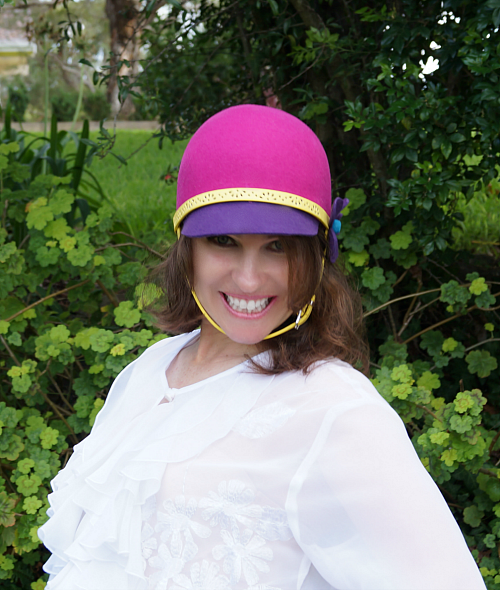 I started with the pink and purple felts and my basic helmet shape in mind. I wanted to add a strap to this one, and I found a lovely bright yellow belt that popped against my colours and looked great. (Unfortunately, the belt is too short and I can't fit this hat on myself, but luckily Ruanne has a smaller head than me.) I then drew inspiration from a hat with a large spotty flower by James Wedge in 1964 for my final trim. I kept my flower smaller for this hat, but I'd love to make a simpler hat with a giant polka-dot flower on it in future. I'm a little concerned it's ended up a bit Pony Club, but I guess that's ok too. The important this is that it's super cute. And that you can pose like Audrey. 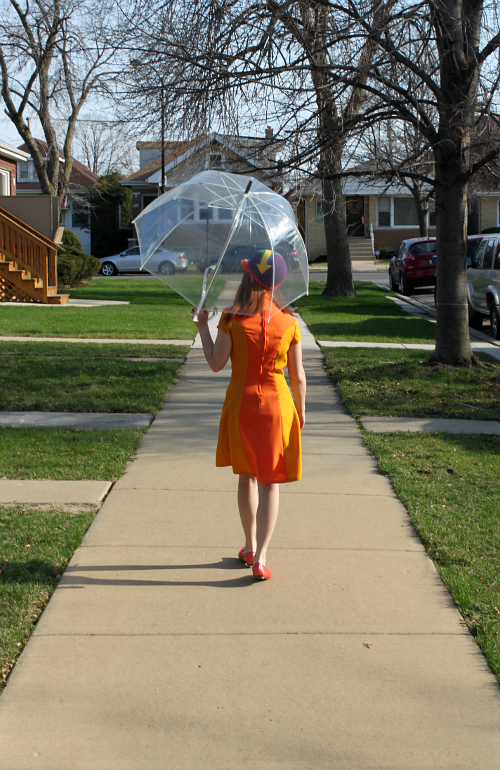 The other helmet hat I made was a collaborative project with Nicole of Manic Pop, who designs and makes gorgeous sixties-style dresses in bright colours and bold patterns. 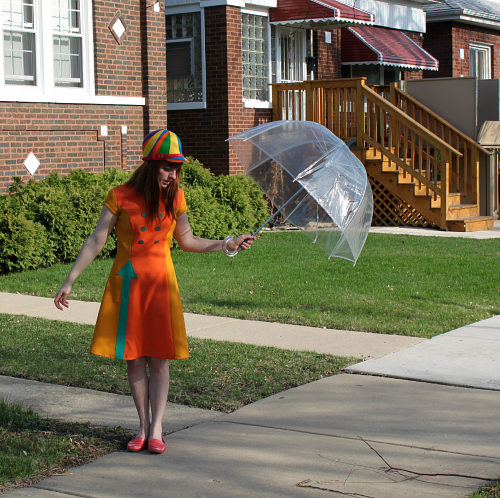 She has designed a dress to go with the hat I made her, and it looks incredibly cool. You'll be seeing the results of our combined design efforts soon! Autumn announced its arrival here with weeks of rain, in what I think of as distinctly Australian style. That is, each day would include both warm sunny times and heavy rain. The bright sky would cloud over to seem like evening in half an hour then thunder and lightning would arrive. We had a blanket of (thankfully small) hail stones that made it almost look like it had snowed (if you squinted enough). The last few days have seen a much more enjoyable amount of sunshine, although it is still cool in the mornings and evenings, and mornings of classic Blue Mountains mist are beginning again. The trickery of photography, the angles we choose to avoid the ugly parts of ourselves and our environments, entertains me, even as I engage in it. 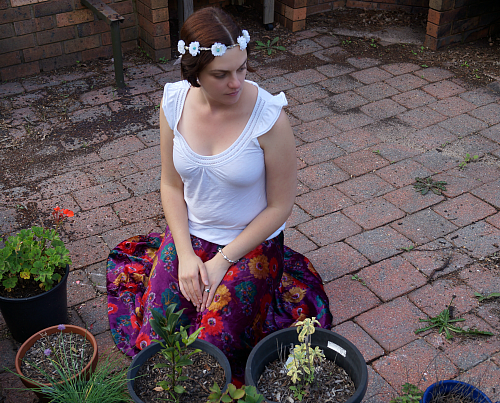 I like the convenience and personal feeling of taking photos at home, but it's actually quite hard to make my garden look good. Last winter, the removal of the three giant radiata pines left us with a wasteland, for the most part. 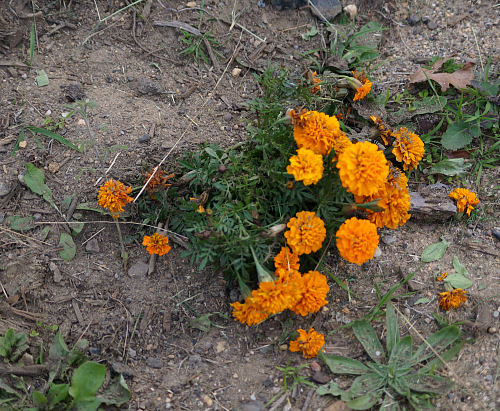 Grass has grown back in most parts, but it is still patchy and it has a long way to go still. Here you can see my gorgeous flourishing herbs and flowers, along with the remains of my very succesful cherry tomato crop, and the Project that is the barbeque area. We have removed the old rusty built-in barbeque, and the rotted wooden benches, but have yet to build the new ones or put the new barbeque in. It is making slow progress, but the barbeque area is one of my favourite projects, and I get very excited about it. Which confuses some people, who aren't quite sure why two vegetarians want a barbeque area at all, as though you can't cook vegetables outside. 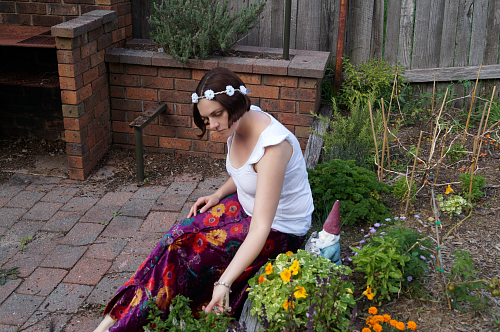 Despite being mostly full of woodchips and weeds, I couldn't think of a better place to shoot my "Hippie" looks than in my own veggie patch, however humble. 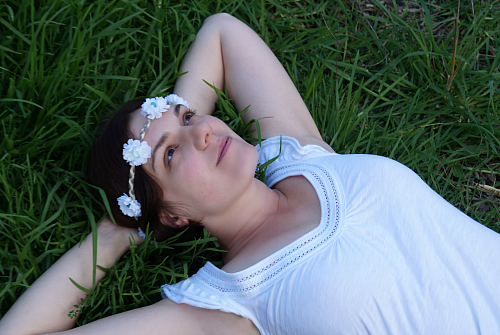 Both of these headbands feature reconstructed artificial flowers on bands of plaited ribbon. The plaits (as well turning boring ribbons into something more interesting) give a bit of stretch that makes the headbands fit easily and comfortably. 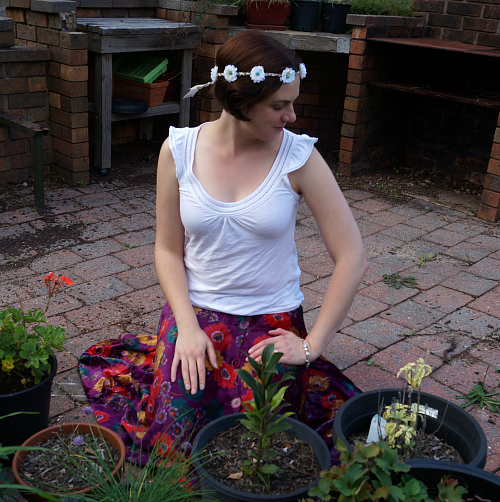 My mother and grandmother have both worn this skirt, which was purchased in the late 1960s. It is by Australian designer Prue Acton. This was passed on to me when I was young, and I always called it my "hippie skirt". It is sublimely comfortable - the velvet is unbelievably soft. And although I haven't been able to do up the top button for over a decade, I don't let that stop me. Prue Acton was a significant Australian fashion designer, who has now returned to her first artistic love - painting. From my brief research, she designed clothes from the early 1960s to the 80s, and designed patterns for Butterick, including this cute mini dress. 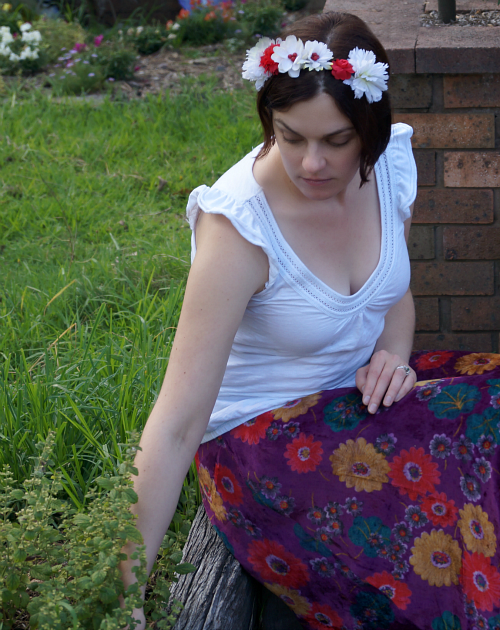 After looking at what examples I could find online of her work, I think my skirt is still my favourite. This mini coat comes pretty close though. 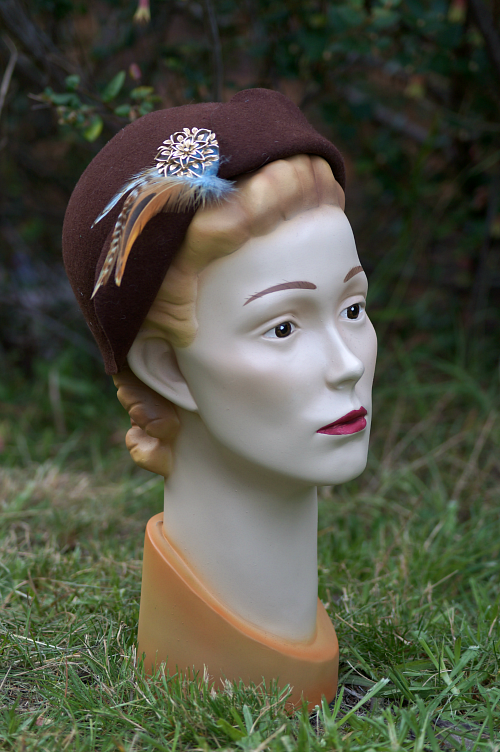 This post is a part of a series: "Hats of the Past: a milliner explores history".